It was distinctly odd – the whole experience. Rarely, if ever, do such images appear in colour. And the apparent drop in temperature is often a feature of such echoes of past lives. The little man was on the left and the lady on the right coming towards me. Nor was there any sense of alarm or unpleasantness. Whether this is/was a pattern haunting – a replay of something that had been done many times over – i.e. visiting a grave – I know not. A bit like with some of the incidents at Langenhoe. But it was all over in a matter of seconds, I suppose… Maybe I was there on a day when in the past this “activity” had taken place. Or maybe I was just in tune with it. I certainly wasn’t thinking about the supernatural. Sceptics will always scoff, allowing of course for the other side of the coin – that being that such sightings are born out of wishful thinking. In which connection, I have in my hand a photograph of the church at Borley. A photo which I took more years ago than I care to remember, in the summer of 1986, looking up the churchyard path. Again I was in Suffolk with my late parents and taking rubbings of brasses at Long Melford, Little Waldingfield and so on. At this point, I should admit to having a lifelong interest in the supernatural – not the silly nonsense which so often is associated with it – particularly when say the BBC or television companies “do” a programme on an alleged haunting expecting that everything will play out for them. Only of course it’s not like that. And when it doesn’t, those who hold a genuine belief in all of this, and which I do, are ridiculed. But back to the photograph. The church at Borley – I was obviously well familiar with the story associated with both it and the rectory – was then kept open; these days because of idiots, Borley is one of a handful of churches in Suffolk which are kept locked unless there is a service. My late mother and I both remarked independently of each other that there was a curious humming in the air which seemed very heavy and oppressive. No more than that. I then took the photograph, about 7pm in the evening … Looking at it a year later, having been tucked away in a book, standing in front of one of the topiary bushes is the unmistakable figure of a nun. You can see the face eyes, nose mouth wimple, gorget and mantle. From where I was standing I would estimate her to be about 5′ 6″ in height.outline. Clearly I saw nothing when I took the photo but I’ve just looked at it again and the figure is still there. Or is it wishful thinking? I don’t think it is. All these years later, I’ve the print, unfaded from being kept where it is, but not the negative. And there is a family connection with the Bulls – my mother’s maiden name. She and her parents were living at Sudbury at the time all of the Borley story began kicking off in the newspapers in the late 1920s. What took them there was my late grandfather who was shell shocked in the Great War. A dispatch rider. After it was all over, he could never settle, and the family moved as he went from one job to another. I believe that it was his family connection with the Bulls that got him a job as a publican of one of the pubs in Sudbury. My mother insisted that she knew nothing of the stories associated with the rectory, but since the family was then living but half a dozen miles away, I find that rather hard to believe, and she was always rather vague (deliberately so?) as to why it was the family ended up in Sudbury. Now from Ludlow in Shropshire with an interest in the above obviously, also in the stories of M. R. James, and in medieval history, monumental brasses, stained glass, incised slabs, heraldry and so forth. 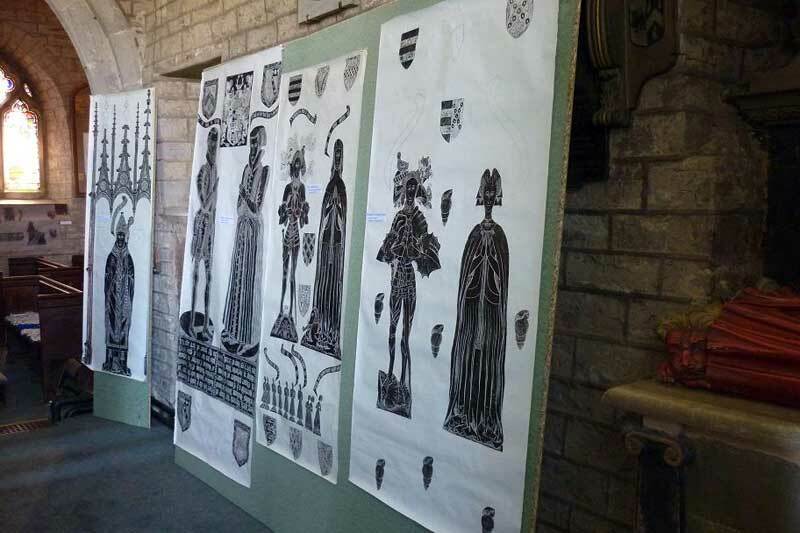 Obviously I spend a lot of time on my own when I am taking rubbings which can take anything from half an hour to seven or eight to complete – see photograph below of part of an exhibition I mounted – it will give you some idea of the end result. Only about half a dozen of us doing it these days in the entire country. Generally speaking, children can’t be bothered – by and large – they’re not taught history in schools and obtaining the requisite materials, unless you know from where they may be obtained, is not easy. Not much more I can add to the Old Hunstanton story. Believe it or don’t believe it. That’s what happened. JONATHAN MOOR lives in Ludlow, Shropshire, and has an interest in the paranormal, the works of M.R. James and medieval history. I’m sorry, I can’t see it. Look at the topiary on the front right. Just to the right of the yellow flowered bush. Holes and shadows in the topiary resemble the outline of a nun with a ghostly face ! Is Paranormal Bullying out of control? Are Ghosts More Commonly Heard Than Seen?